Learn more about the the science of reproduction. Dr. Teresa Woodruff, creator of Repropedia, is offering a free online course exploring the world of reproduction. Spermatogenesis is the process by which male gametes (spermatozoa) are formed in the seminiferous tubules of the testis. 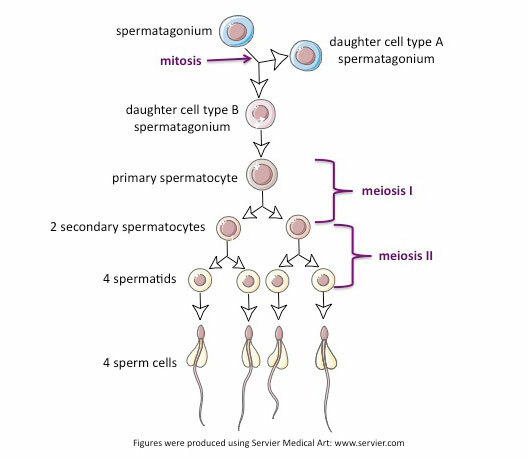 Spermatogenesis consists of three phases: mitotic division of the spermatogonia (proliferation), meiotic division of the spermatocytes to produce spermatids (meiosis), and differentiation of round spermatids to form elongated spermatids (spermiogenesis). Germ cells remain in contact with Sertoli cells throughout spermatogenesis. After spermatogenesis in the testis, spermatozoa are still immotile and must go through further maturation processes in the epididymis and female reproductive tract before they are able to fertilize an egg. Copyright © 2005-2011 Oncofertility Consortium®. All Rights Reserved.